Hamas | What Did You Say? CAIR is an unindicted co-conspirator in a Hamas terror funding case — so named by the Justice Department. CAIR officials have repeatedly refused to denounce Hamas and Hezbollah as terrorist groups. Several former CAIR officials have been convicted of various crimes related to jihad terror. 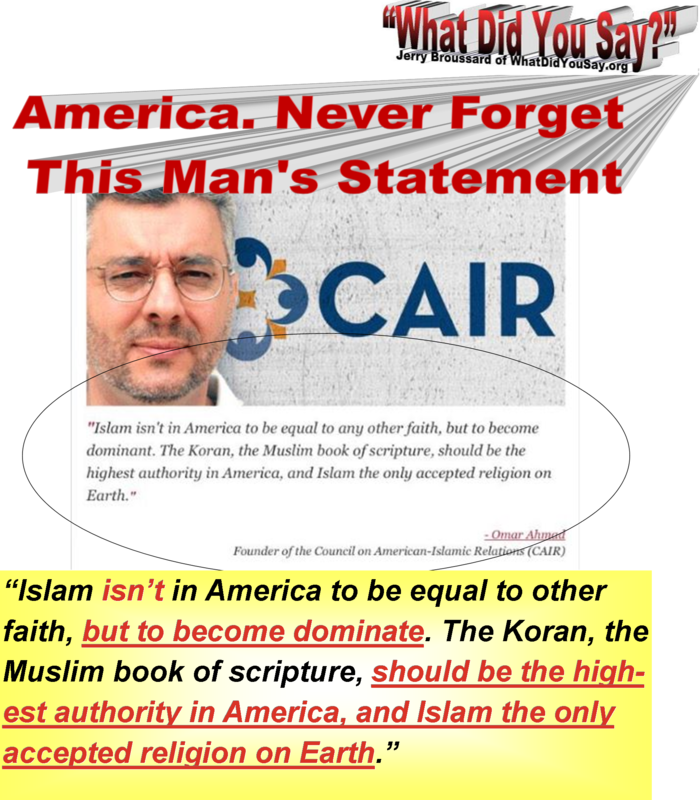 CAIR’s cofounder and longtime Board chairman (Omar Ahmad), as well as its chief spokesman (Ibrahim Hooper), have made Islamic supremacist statements about how Islamic law should be imposed in the U.S. (Ahmad denies this, but the original reporter stands by her story.) CAIR chapters frequently distribute pamphlets telling Muslims not to cooperate with law enforcement. CAIR has opposed virtually every anti-terror measure that has been proposed or implemented and has been declared a terror organization by the United Arab Emirates. Ayloush himself, in 2017, called for the overthrow of the U.S. government. But fundraising with Hamas-linked CAIR is not career suicide for Ilhan Omar, although if a conservative candidate appeared with an analogous group as unsavory as CAIR, it would be. Omar is vying to succeed Keith Ellison, who has never shied away from CAIR, and never suffered any political fallout for his connections to the organization. CAIR raised large amounts of for Ellison’s first campaign, and he has spoken at numerous CAIR events. This is an indication of how topsy-turvy our political discourse is today. Obama! You heard me right. Obama is paying for these riots but not directly. Let us start with Daniel Greenfield who wrote an article with one of the best paragraphs I have read in a news article. With writing like that he could be working for CNN or the New York Times… Someday he could be a speechwriter for the Hillary 2032 campaign. But his writing does make a good point, Liberals are finally showing their true colors especially as far as their lack of support from Democrats is concerned. Greenfield discovered that Hamas was paying protesters. $100 a day, $200 if you get shot by steel or rubber bullets. $500 if you are seriously wounded and your family will get $3,000 if you are killed. So, where would Hamas get that kind of money? They are hurting financially and don’t have the kind of money necessary to run the program. So, where did the money come from? Who is the biggest sponsor of terrorism in the area? Iran. Now, Iran’s economy is very bad. There are no jobs and the infrastructure is falling apart. But Uncle Obama did send them pallet loads of money. It’s a safe bet that they haven’t used any of that money to help the people or to fix their infrastructure. It’s so good to finally have a president after 8 years of nothing. Bearing in mind the mass protests that have rocked the streets of numerous Iranian cities for several months by poor and unemployed Iranians fed up with the mullahs’ regime, and considering the nation’s crumbling infrastructure, it is obvious those several billions of dollars weren’t spent building up the country or helping the people. Rather, it went into the pockets of the Islamic Revolutionary Guard Corps, where it was then distributed to Iranian-supported rebels and terrorists in hot spots around the globe, most especially Hezbollah militants in Lebanon and Syria, the Houthi rebels in Yemen, Shiite militias in Iraq and of course the Hamas terrorists in Gaza, among others. Timed to coincide with the Nakba, or “catastrophe,” of the anniversary of modern Israel’s founding — as well as the opening of the U.S. Embassy in Jerusalem — Hamas incited protests and violent riots near the security fence that separates Gaza from Israel. The liberal media wailed and moaned about the dozens of dead — many of whom were Hamas terrorists — and thousands wounded from Israeli counter-protest gunfire and tear gas. As evidence of the cruelty of Israeli security forces toward innocent Palestinians in Gaza, the media focused on a dead Palestinian baby. The infant’s tragic death, however, turned into a propaganda win for the terrorist organization. A prime example of what could easily have been written by the Hamas propaganda department itself was an article in the Los Angeles Times which lamented the death of the 10-month-old baby girl — Layla Ghandour. But a former journalist for the L.A. and New York Times astutely noted that, buried midway through the blatant piece, it was revealed by a doctor in Gaza that the baby had died from a pre-existing heart condition. Left unstated is that he probably didn’t want to be identified so he could avoid suffering the wrath of Hamas for undermining their propaganda victory with the liberal American media. Nevertheless, even as the family acknowledged the pre-existing heart condition, they still blamed Israeli tear gas for the little girl’s death. Even if that were the case, blame would appear to fall on the shoulders of the girl’s 12-year-old uncle Ammar, who was charged with watching the baby at home while the protests at the border took place. Still, he carried the baby there and proceeded all the way forward to the security barrier. Several paragraphs later in that same article, it was noted that the dead baby’s mother and father had lost a baby boy just a year ago to the exact same heart condition, due to the fact that the father couldn’t afford or obtain the proper medication to treat the condition. On a related note which reveals the sort of pure whitewashing propaganda this article was, the girl’s father was described as being unemployed after he lost his job smuggling “food, medicine, weapons, fuel and other goods” through the illicit tunnels that connected Gaza with Egypt, prior to the Egyptians shutting those tunnels down. The girl’s mother was said to live with her grandmother and at least 12 other family members who all subsisted off a stipend provided by the Palestinian Authority because two of the grandmother’s sons had “died in previous hostilities” with Israel. In all likelihood, that means those two men were members of Hamas or another terrorist group who had been killed while committing a terrorist act. Hamas and their allies in the liberal media thought they could use this dead baby as a propaganda coup against Israel, but the truth surrounding the baby’s unfortunate death reveals the Israelis were not to blame. 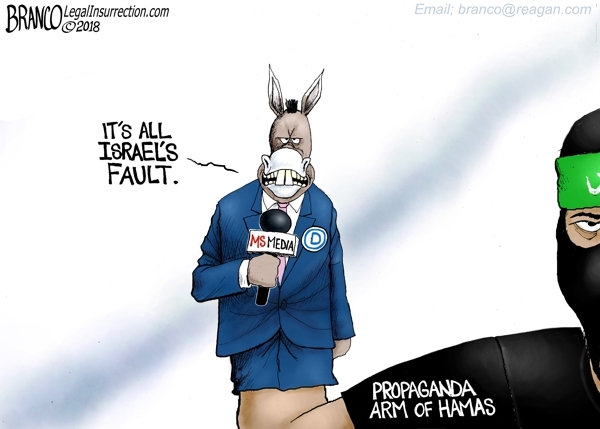 Considering the false narratives and blatant lies that have been promoted by the media in regard to the Hamas-instigated conflict at the Gaza/Israel border, it is no wonder that the media has lost so much credibility among the American people. The mainstream media continues its role in dispensing propaganda for Hamas in regard to Palestinians killed in Gaza.